The fact that Qatif Oasis had a prominent presence in the Persian Gulf region can be easily seen from the first look at the above map, which dates back to 1606 and was presented at the Museum of Amsterdam. The map is 46 cm wide, 37 cm in height and in color. The map shows the most important regions in the Middle East and gives precise details on the Gulf region and their names. What is striking in this map is the labeling of the Gulf as «Mare Elcatif Olim Sinus Arabicus» which means «Qatif Arabian Gulf». The map dates back to the days of the Ottoman Sultan Mohamed II. The map also shows the vast area of Qatif. 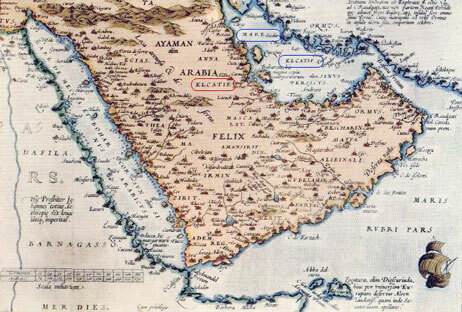 In fact, some early European maps labeled the present-day Arabian (Persian) Gulf as the «Sea of Elcatif». It is difficult to picture the quiet oasis farming towns around the bustling modern center of oil of Dhahran near the Gulf in eastern Saudi Arabia as the pivot of a struggle between great empires, centuries before the oil beneath had any meaning to the world. What, you might ask incredulously, would they fight over? Dates? Sand? Fish? None of those and all, and more besides. The answer is trade. Three thousand years before the first oil well was brought in on Dhahran Hill, al-Hasa, as these lands were known, was the center of a great mercantile empire of its own between Iraq and India. It kept this role, if not the political power, as centuries passed. Control of al-Hasa meant control of this trade. In the early 1500's it was the Portuguese seaborne empire that made a play for it, and the Ottoman Empire that countered. Throughout the Middle Ages Western Europe bought its pepper, ginger and cinnamon from the monopoly of the Mediterranean middlemen. To break this monopoly Portuguese sea adventurers braved the uncharted depths of the Atlantic down the west coast of Africa. Finally, in the late 15th century, while Columbus and Spain sailed west to America, Portugal pushed east, rounding the tip of Africa into the Indian Ocean and wealth. It was Portugal's turn to control the spices. From 1517 on, it was the Ottoman Turks who ruled the Arab lands which depended on this trade. It was up to them to break the Portuguese blockade and keep the channels clear. The Ottomans sent an expedition in 1551 down the Gulf to confront the Portuguese and claim the Arabian coastal towns for the sultan. The Portuguese had by this time fortified the island of Hormuz at the narrow entrance of the Gulf; that left the Turks with only one reasonable first-line site, the al-Hasa oasis. When the Turkish expedition stumbled and splashed ashore across the tidal flats of Qatif Bay in 1551 no army opposed them. While this went on all available troops were put to work with pick and shovel, throwing up a fort in Qatif to consolidate the beachhead. Centuries later, long after the Turks had gone, these fortifications would be remembered by the people of Qatif as the «Portuguese Fort»- with hindsight, a bitterly ironic comment on the Turkish protection.